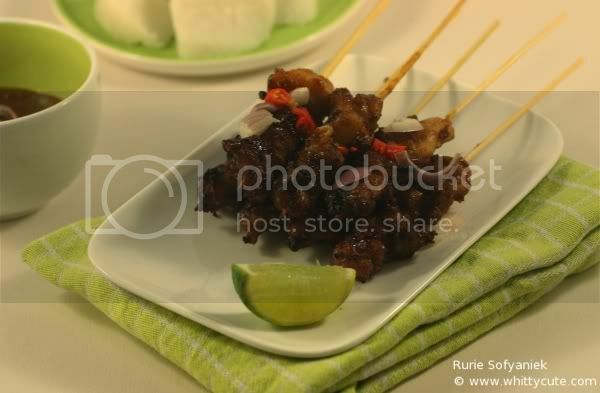 I always like sate, ok on the second thought which Indonesian food that I don’t like? And this month’s theme of masbar is sate, hmm my mouth watered just thinking about all the sate that I could see from all this month’s participant. – Pound spice paste ingredients with pestle and mortar or food processor until smooth. 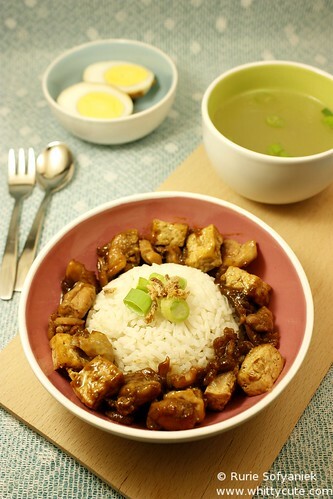 – In a bowl mix together, spice paste, kecap manis, oil and cubed chicken then marinate for minimum 2 hours. 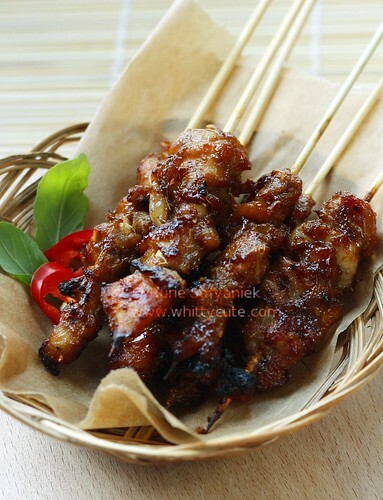 – Arrange the chicken on a sate skewers. – Grill until done while brushing sate with the rest of the spice mix. Yay I finally could upload my entry for this month’s masbar. Don’t know why my spirit to blog has dropped a bit lately. I still cook and bake and take photos too but just lazy to upload it into this blog… :s Hopefully it wouldn’t be long until I found my mood back again. 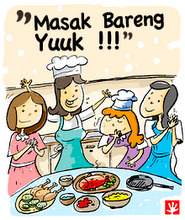 This month’s theme is chicken dish from North Sulawesi. 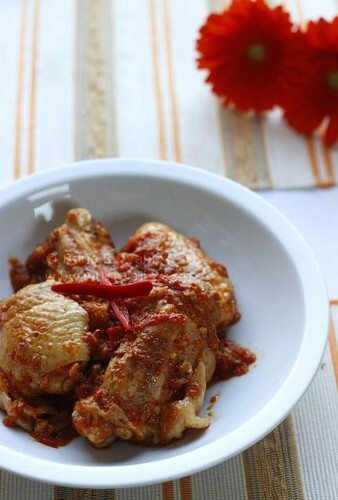 Chicken is my favorite meat and dishes from North Sulawesi is usually hot and spicy. I love chicken in any way and my life would be bland without my spices and chilies, so I was more than happy to make this dish. – Marinade chicken pieces in lemon juice and salt for appoximately 15 minutes. – Heat up oil in a pan, add spice paste, ginger, lemongrass and kaffir lime leaves when the oil is hot. – Fry until the spice is done, add chicken pieces. – Continue stirring until chicken turns color. – Add water and salt, continue cooking until water has evaporated and chicken is cooked. – If you prefer, you could grill the chicken little bit just until it’s nicely brown. 1. Deciding what to cook. 2. When decided then thinking whether I have the recipe or not. 3. Calling my mother in Indonesia for the recipe (calling cost money). 4. Modifying the recipe to what is available in the place where I live. 5. Shopping for the ingredients (if I want to make authentic Indonesian food I have to prepare extra cost since I live abroad and prices of authentic Indonesian ingredients are not that cheap). 7. Cooking; while food is being cooked I would think about how I wanted the picture to look like, what composition is nice etc. 8. Pre photo session; trying to find where the good light source is, drag the table top to where the light source, taking out the photo properties ie; plates, flower, placemats (the properties also don’t come for free) and arrange the setting. 9. Photo shoot (with camera which I know is not cheap) which usually ended with lots of pictures but only 1 or 2 are presentable. 10. Cleaning up the mess I made, washing up. 11. Photo editing (I’m not really good at this part so this could easily take some time). 12. Photo uploading to Flickr (which is btw not for free). 13. Translating recipe into English. 14. Typing recipe and post. All of those steps are not instantly done in a minute and then you get a photo and a recipe. They cost time, energy and money. We produce every post with lots of thought, love and passion for food and food photography. Which later we share the result in our food blog. But that doesn’t mean anyone can just grab it anytime they please without saying anything esp. not for commercial purposes. 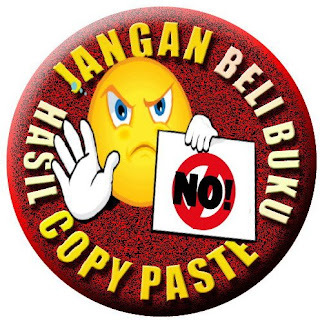 Maybe I do sound harsh and cynical, but I do feel the anger of my fellow foodie blogger who got rob by some so-called book publisher in Indonesia; Cam Boga and Pustaka Anggrek. The publisher deliberately took their pictures (and some also with the recipe) without permission and publish it in a commercial recipe book. For more info about the issue please do click Budi Sutomo, SLF MP, Vivi Liong, Arfi Binsted. And please do not buy copy paste book!!!!! de for 10-15 minutes then rinse. – Pound all the spice paste ingredients until smooth. 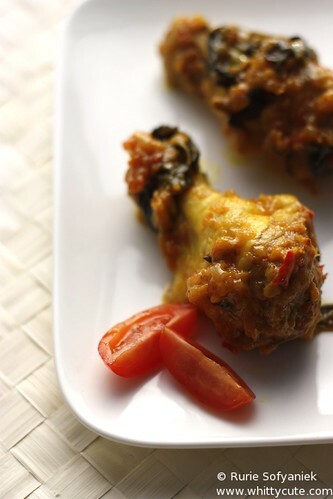 – Heat a little bit of oil in a pan, when it’s hot fry spice paste, salam leaves and lemongrass. Continue stirring until fragrant. – Add chicken, stir until chicken turns color. – Add coconut milk and some water just enough so the chicken sink, lower the fire and continue cooking until the sauce has thicken and chicken is done. – Grilled chicken in a grill (or alternatively you could do it in an oven), brush now and then with the remaining sauce. Grill until both sides are nicely brown. – Serve with steaming white rice, remaining sauce and raw vegetable; cucumber, sweet basil, cabbage (optional). And yes my pictures are not that good but they are mine so from now on I also put my watermark in the middle and not in the bottom anymore. Have you ever stopped by at Deetha’s blog? 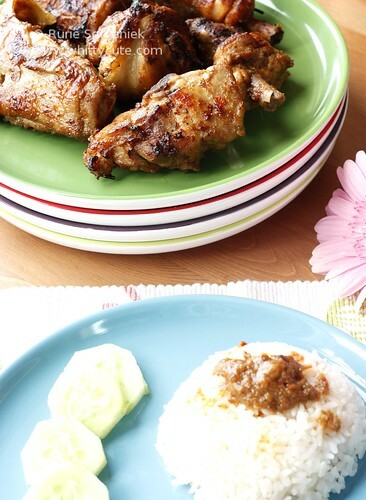 She has loads of Indonesian recipes I never knew about but really worth to try like this one. – Pound all the smooth spice paste ingredients into a smooth paste. – Pound all the coarse spice paste ingredients into a coarse paste. 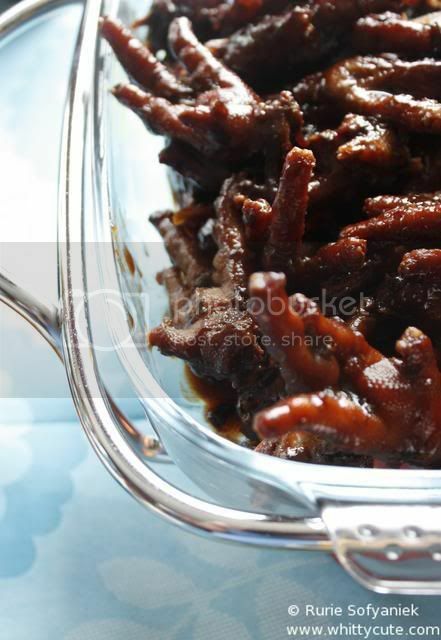 – Heat vegetable oil in a pan, add kaffir lime leaves and lemongrass, stir until fragrant. Add smooth spice paste, stir continuously until spice paste is done. – Add coarse spice paste, stir until fragrant, add tomatoes and spring onion, continue stirring. – Add chicken pieces, stir until chicken has turn color. Add water, continue cooking until water has evaporated and chicken is cooked through. – Add hairy basil leaves, stir until the leaves are stale. Ready to be served. 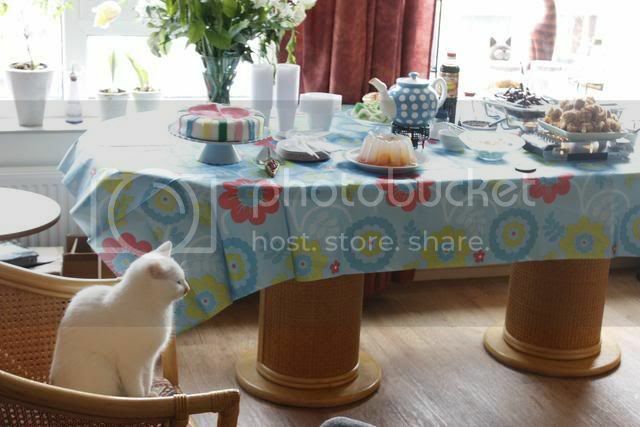 Some photos and recipes from my and also my friend Eni birthday brunch. 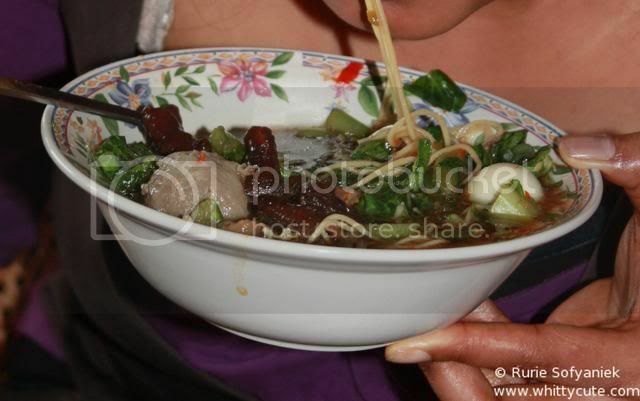 For this mie ayam (chicken noodle) recipe just follow here. 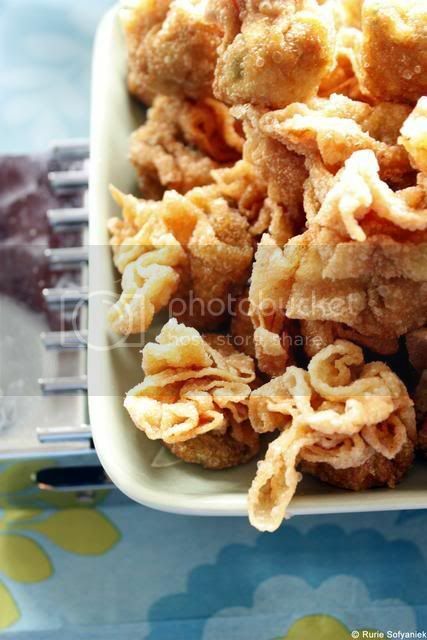 For this pangsit goreng (fried wantan) recipe just follow here. – Heat oil in a pan, add garlic and stir until fragrant. – Add minced chicken, stir until turns color. – Add mixed vegetable and stir until vegetable is wilted. – Add coriander, oyster sauce, gember siroop (ginger), salt and pepper. – Heat through until all ingredients are cooked, turn off fire. 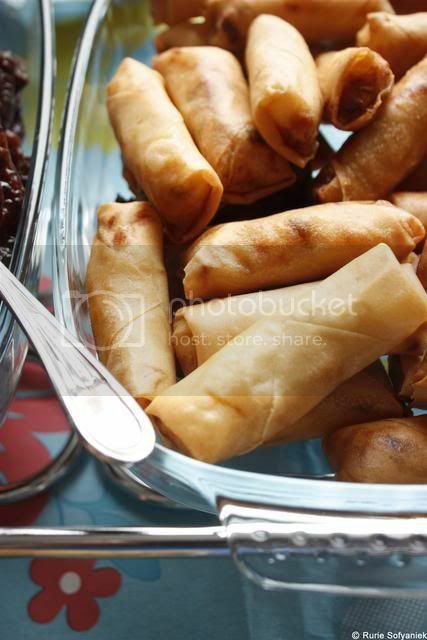 – Assemble the lumpia and use the egg white to seal the lumpia. – Serve with lumpia sauce. The method and recipe is basically the same with the mie ayam topping but first I deep fry the chicken feet until golden brown then soak them in cold ice water for overnight so they were nice and plump. Furthermore I added mushroom soy sauce. Finally I got the chance to try the famous TCCC (Triple Choco Caramel Cake) by Teh Uceu. 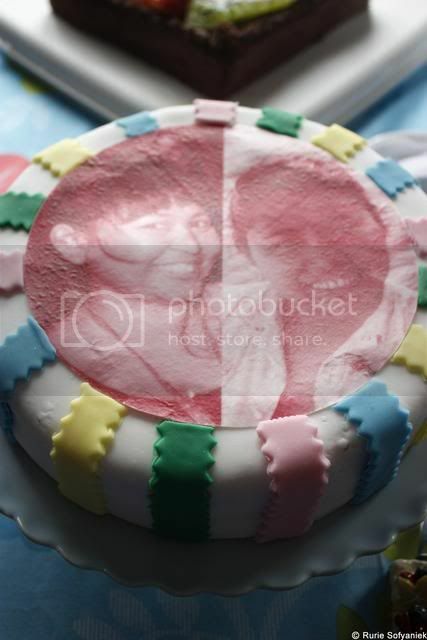 But I couldn’t make it as pretty as hers…and somehow my cake was a bit dense like brownies. Is it suppose to be like that? But the taste was so good….I can still remember the chocolatey caramelly taste…oh forgive my weird vocabulary. – Melt butter in a double boiler (or microwave), add DCC, mix well, set aside. – Whisk eggs with sugar until half fluffy, add emulsifier and continue whisking until white and fluffy. – Carefully add flour into the batter. – Add the melted butter and DCC, mix well. – Brush square or round baking pan with butter and sprinkle flour evenly. – Pour batter in the baking pan and bake in a preheated oven of 170C until done. – Heat fresh cream in a pan with low fire but do not let it to boil. – Add DCC and butter, mix well. – Put in the fridge for couple of hours until ready to be used. – Cook sugar with water (1) in a low fire until it turns into caramel. – Add water (2) into the caramel mixture, continue cooking until caramel has melted and well mixed. Set aside. – Canned or fresh fruit; kiwi, mandarin, strawberry etc. 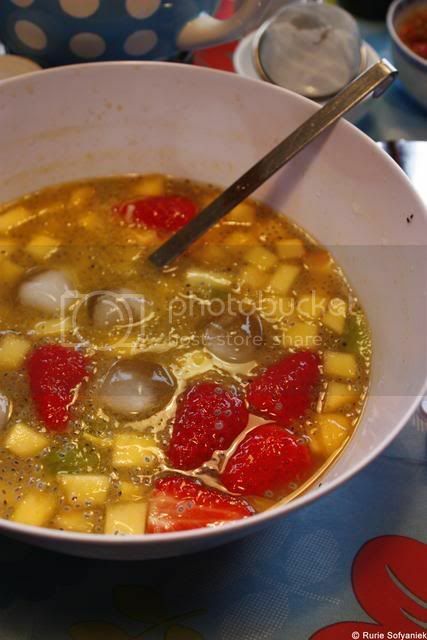 – Clear jelly mixture to brush on top of the fruit. – Sliced cake into two equal parts. – Brush caramel syrup onto the surface of the cake. – Spread some chocolate ganache on the centre surface (about 1 cm thickness), top with the other part of the cake. – Spread the rest of the chocolate ganache evenly on the surface of the cake. – Decorate as your desire with the fruits. Then after making sponge cake you would get lots of egg whites…it’s time to make this one 🙂 made only from egg whites. – Whisk egg whites, salt, emulsifier and water until half fluffy. – Add sugar bit by bit while whisking until white and fluffy. – Add flour, powdered milk and baking powder. – Add melted butter, condensed milk, vanilla escence . – Take 1/2 batter and add pandan paste, mix well. – In one spot pour the batter alternately in a baking pan (I used 7 muffin mould). – Steam in a preheated steamer for 15 minutes until done. – To yield a pretty zebra pattern, do pour the batter consistenly in one same spot. 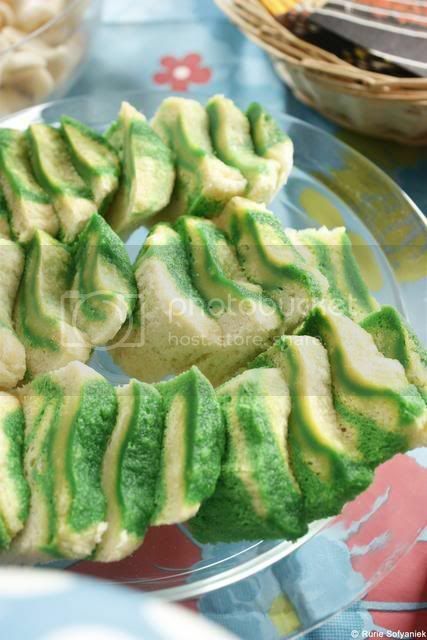 Source: Book of Variasi Kue Lapis Sederhana Sampai yang Rumit – Sedap through Deetha. And for the last one inspired from Deetha 🙂 it was real good, refreshing, highly recomended. – Mix everything in a big bowl. Tips: you can use all kinds of seasonal fruits. My first encounter with Indian food was years ago when I was still living in Hamburg, Germany. I was sort of living (plus working) with a host family, and my host mother happened to be Indian. She would cook nice fragrant Indian food for dinner and I instantly like them. This one is a real easy Indian food, good for Indian food beginner like me 🙂 It’s nice to eat as it is or maybe also to accompany a curry. – Wash rice throughly, set aside. – Heat the cooking oil in a deep pan on medium heat. Add the onions and fry till soft. – Add the ginger and garlic pastes and fry for 1 minute. – Now add all the spice powders and mix well. Cook/ brown the masala (onion-ginger-garlic-spice mix) till the oil begins to separate from it. You may need to sprinkle a little water over the masala as it cooks, to keep it from burning. Stir frequently while browning masala. – When the masala is cooked, add the tomato to it and cook till pulpy. – Add the rice, the mixed veggies to the masala, add salt to taste and pour in the warm water. Stir well. Cook till the water comes to a boil. Stir and monitor the cooking till most of the water dries up and the rice begins to develop ‘pits’ on its surface. Turn the heat down to low/ simmer and cover the pan. Cook till done. You will know the rice is done when you press a grain between your thumb and index finger and it squishes completely. – Turn the heat off now as some cooking will continue to take place even after you do that. Let the dish rest on the stove (turned off) for 5 minutes. 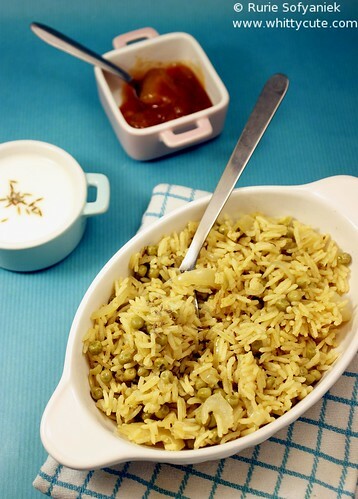 – Uncover and garnish the Pulao with the chopped fresh coriander. Serve piping hot with yoghurt and mango chutney. At first I saw this one at Deetha, I thought oh so yummy, I must try this. And boy did I make a good decision. Thanks Yu Lidia for sharing the recipe. – Saute cracked garlic with a little bit of oil until fragrant. Add dried shrimp and continue to saute. Add the cut meat, soy sauce, sweet soy sauce, five spices, cut tofu, salt, pepper and some water (just enough to make all soaked in). – Add boiled egg and continue to cook until it changes color to brown and the water decreases into half of the initial quantity. Put it aside. – Make the broth, saute the ginger and garlic until fragrant, Add water, chicken bone and salt. Simmer for some time until ready to be used. – To serve, in a bowl, place some steam rice first and then add the meat mixture with the brown sauce, half of the brown egg, 1-2 tbs of garlic solution (if preferred). Sprinkle some chopped green onion and fried onion. Pour some boiled stock over. Add sambal kecap as needed. After drooling for couple of days seeing Lidia’s and Deetha’s Buffalo Chicken Wing, I decided with full strength that I had to make it!!!! But I wanted a recipe that doesn’t require me to fry the chicken. Found a recipe in Allrecipes and after reading all the useful reviews I decided to tweak the recipe a bit according to the reviewers suggestions. So here is my Buffalo Chicken Wing. – Preheat oven to 375 degrees F (190 degrees C). Put one cookie lined with baking paper in the bottom surface of the oven. This to prevent the bottom surface of the oven to get dirty from the chicken wings dripping. – Toss wings in the flour and garlic powder. – Bake wings in preheated oven for 30 minutes, or until cooked through and crispy. Use an oven rack so the dripping would fall to the cookie sheet below. – Meanwhile, in a small bowl combine melted butter, ABC extra hot sauce, tomato sauce, chili powder, honey and cayenne pepper. Mix together. 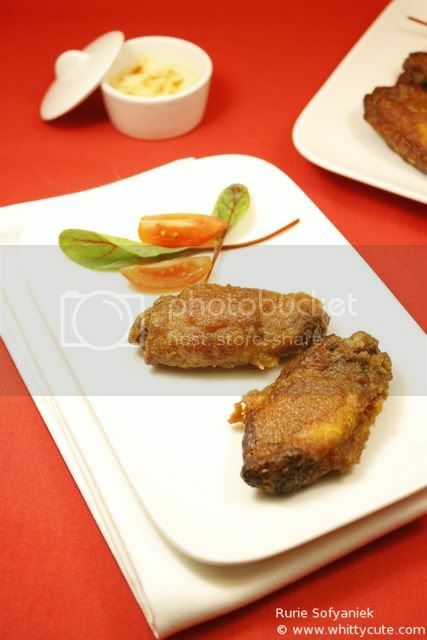 – When wings are baked, dip in sauce to coat well, then shake off excess and return coated wings to baking sheet. Reduce oven temperature to 250 degrees F (120 degrees C) and bake for 10 minutes. – Repeat coating process and bake another 10 minutes. – Take some peanut sauce and thin it little bit with kecap manis. – Dip the sate in the peanut sauce until all cover with the sauce. – Grill until sate is done. 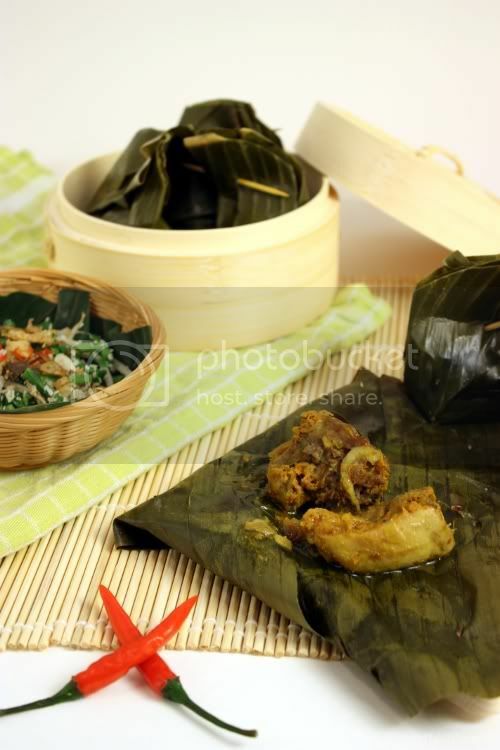 – Serve with peanut sauce, diced shallots, minced bird’s eye chili, lontong (pressed rice). – Squeeze kaffir lime over the sate. – Grind garlic, candlenuts and red chili until smooth. – Fry oil in a pan, fry spice mix until fragrant. – Put the grind peanut in a pan, add water, salt and spice mix. – Continue cooking until sauce is smooth, adjust water to get the consistency of your liking. Finally I got the chance to participate in Masbar event. 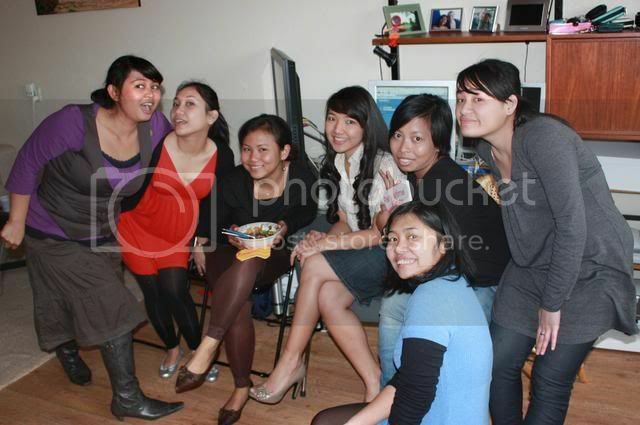 It’s a monthly foodie blogger event which is organized by Ayin, Deetha and Shinta. There would be monthly theme that we could all try out and then the result should be up and about in your blog last Thursday every month, no time deadline. Eventhough the theme has been picked by them but it doesn’t mean you can’t improvise, you could use whatever recipe you like as long it represent the theme. Easy right? For this month we have got Pepes Ayam as theme. In English it’s a bit tricky to translate…hmm let’s see, how about “Steamed Chicken in Banana Leaves”. There are hundreds version of Pepes Ayam in Indonesia but because I used to live in Bali all of my life I chose to make Tum Ayam. Tum Ayam is indeed Balinese version of Pepes Ayam. 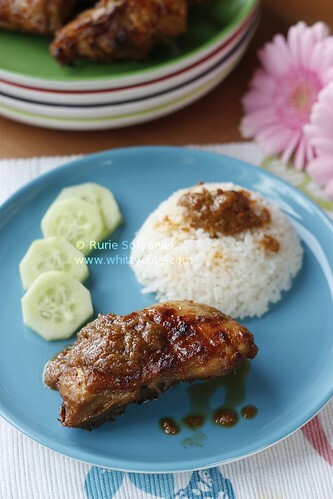 Since the spices used in making Tum Ayam were a lot, the taste was so rich of flavor, very Balinese indeed. The best way to eat it is when it’s just came out of the steamer, open the banana leaves, and some juice will burst out and never, I repeat never spill or throw that juice away because that is just the second best part after the chicken itself. Scoop some rice on the banana leaves and let the rice absorbs the juice. Eat with your hand…hmmmm…..can’t describe that with words…. – To make the spice paste, use a pestle and mortar (I used food processor) to pound all the spice paste ingredients into a paste. – Heat oil in a wok add the spice paste and stir fry for about 3 minutes. Add the coconut milk and boil until all liquid has almost completely evaporated. Remove the wok from the heat and set aside. – Cut 20 pieces (mine was 10) pieces of banana leaves. Place 1 salam leave in a bottom of the leaf and top with the chicken mixture. Fold both sides of the leaf over the filling. Fold the open ends over and secure with a bamboo strips or toothpicks. Trim the empty ends at an angle to form a point at either end of the parcel. – Put the parcels into a steamer, ensuring they rest above the water. Steam until cooked through about 25 minutes. Serve with white rice and jukut urap.